Sheets up to 13.8" x 19"
The FD 90 Rotary Perforator/Creaser is specially designed for finishing printed sheets, up to 13.8” x 19”. Its three-tire friction feeding system reliably feeds up to 6,800 sheets per hour, and can create up to 5 parallel perforations and/or creases in a single pass. Perforating allows for easy separation of multiple printouts, tear-offs, postcards or tickets on a single sheet, while creasing allows for easy folding and reduces unsightly cracking in digital printouts. Operation is easy: simply load printed sheets on the extendable infeed table, adjust the side guides and press the power button. Sheets are fed and perforated and/or creased automatically then stacked neatly on the telescoping outfeed table. 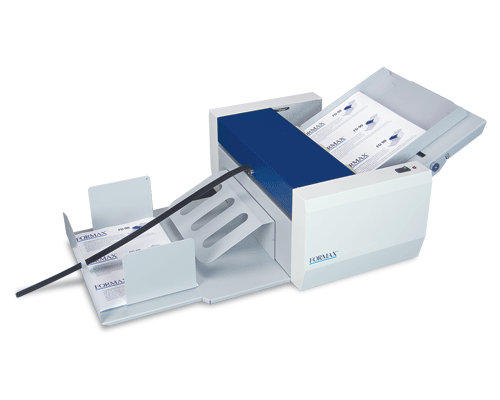 The FD 90 can easily accommodate paper weights from 55 - 180gsm. Standard set-up includes two perforating wheels, one creasing wheel and paper guides. Options include additional perforating sets, microperforating sets (17 tpi), creasing sets and guide strips to accommodate 55 - 60gsm paper. The FD 90 is ideal for small print shops, on-demand and in-plant finishing applications including postcards, invitations, tear-offs, brochures, billing statements and more.